As new flagships keep pouring out one after another, like the iPhone XS/XR, Samsung Galaxy S10, Huawei Mate 20 Pro, and etc, it is quite usual for smartphone users to switch to a new phone from time to time. Then have you bought a all new phone and excited to enjoy the new features of your device? But unfortunately, all the old messages from your WhatsApp will not be available with your new device. Though the company behind WhatsApp knows that people do change phones and so they have made it easier for their users to transfer WhatsApp data from Android to Android, and from iPhone to iPhone, it is still a huge headache to transfer WhatsApp chats from Android to iPhone, or from iPhone to Android. So, in the following article, we will show you 4 methods about how to transfer WhatsApp from Android to iOS and iPhone to Android in an easy and fast way. Read on to learn. 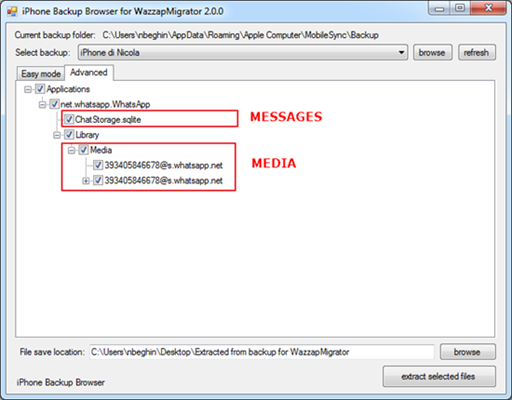 Jihosoft WhatsMate is an all-in-one WhatsApp Manager toolkit that can help you transfer WhatsApp messages from Android to iPhone, or from iPhone to Android. 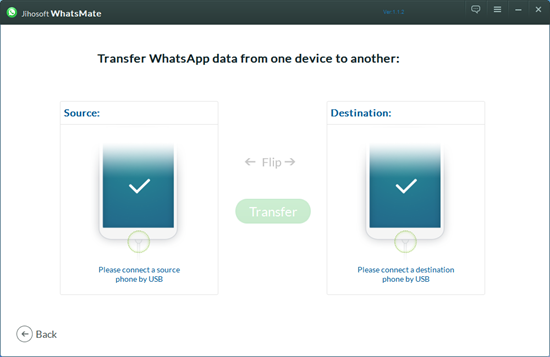 Besides WhatsApp messages, WhatsApp contacts, call history and all kinds of multimedia inside the chat conversation can also be transferred with this WhatsApp transfer tool. Tip: In addition to the WhatsApp transfer function, this software allows you to preview all the WhatsApp data, and selectively choose any of them to recover, backup and restore on both Android and iPhone devices without downloading any third party apps on your smartphone. Step 1. Install and launch this WhatsApp Transfer Software on your Windows computer. Step 2. Connect both your Android and iPhone to PC via USB cables. Then follow the on-screen hints to make your phones be recognized by the program. Step 3. The program will set the Android phone as the source device by default in order to let you move WhatsApp from Android to iOS. If you need to transfer WhatsApp messages from iPhone to Android, you should hit the “Flip” button to set the iPhone as the source phone and the Android as the destination phone. Step 4. Once both phones are connected successfully, under the source phone you will have the options to select chat history, contacts and calls to transfer. After selection, click the “Transfer” button and the program will start to copy WhatsApp messages from Android to iPhone. When it finishes, all your old WhatsApp messages and media will be shown in the WhatsApp messenger running on your new phone. 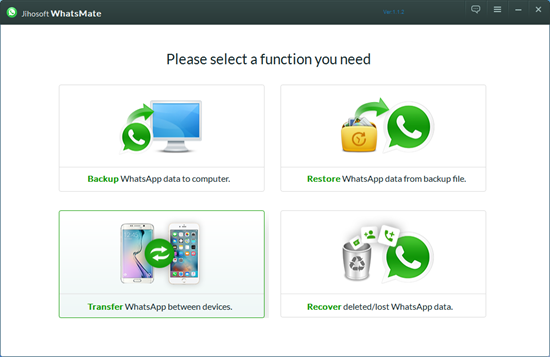 This software enables you to backup WhatsApp data to computer without charge. What’s more, after that you can print out Android/iPhone WhatsApp messages and photos as how they are shown on your phone. Remember to turn on USB debugging when you are connecting your Android phone to the computer. If your iPhone can’t be identified by the program, please install the latest iTunes on your PC first. Never try to disconnect your phones during the transfer progress, otherwise data loss accident may occur on your phones. 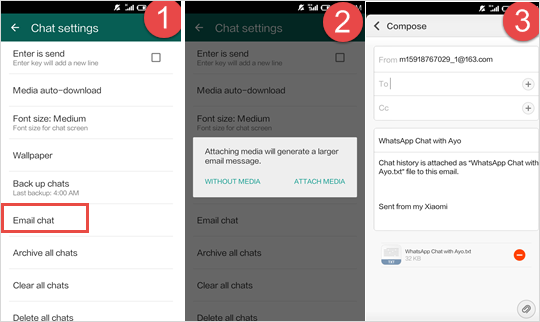 If you just simply want to view and read your old WhatsApp chat history on the new phone, this simple trick must be your best bet to transfer WhatsApp messages to new iPhone or new Android. With this method, you don’t need to have a computer or use any third-party software. What you need to have is an email address, and then follow the steps below to move your WhatsApp chat history from Android to iPhone and vice verse. Step 1. Find “Settings” at WhatsApp from your old device, click “Chat settings“, then click “Email chat” from the showing list. Step 2. Choose the WhatsApp history that you want to transfer. A window will pop out saying that “Attaching Media will generate a larger email message“. Click “Without Media” or “Attach Media” according to your needs. Step 3. Type your email address at the sending interface and mail your WhatsApp chat history in .txt format by clicking “Send“. Step 4. Log in your email on your new device, now you can download and view the WhatsApp messages on your new phone. It is not suitable for massive transfer of WhatsApp data, since it is a very troublesome thing to email messages from contacts one by one. Regrettably, those WhatsApp messages and media can only be readable on your new phone, and you can’t restore them back to your WhatsApp Messenger. If you want your old WhatsApp history seamlessly merge with the history on the new phone, you should apply to the Method 1. Step 1. Download and install the tool on your computer, and connect your Android and iPhone devices to the computer. On the main screen, choose “Restore Social App” > “WhatsApp” > “Transfer WhatsApp messages“. Step 2. Once the Android and iPhone are detected, click “Transfer” to transfer WhatsApp data from Android to iPhone. Step 3. Now wait until WhatsApp transfer completes, then you can then view Android WhatsApp messages on your iPhone. If there is a large amount of WhatsApp data detected on your Android, it will take some time to complete the process. It is recommended to backup your new WhatsApp data on your iPhone, because this program will wipe out the WhatsApp chat history on your destination device. The last three methods all can be used to transfer WhatsApp from Android to iPhone, or from iPhone to Android. 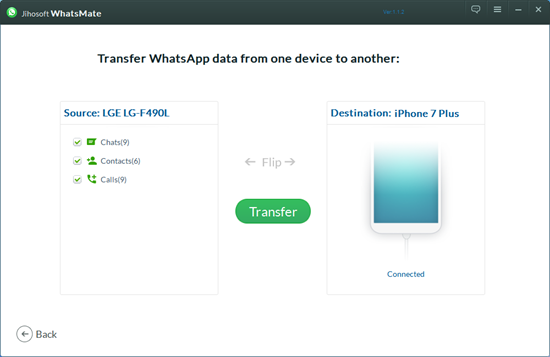 But this method we are going to talk about only focuses on transferring iPhone WhatsApp to Android phone. This method involves two different tools. One is iPhone Backup Browser, and the other is WazzapMigrator app. This method has more steps and the process seems a little complex, so please follow the instructions below carefully. Step 1. Use iTunes to create a complete backup of your iPhone on the computer, and please remember to disable Backup Encryption in iTunes. Step 2. On the computer, install and launch the iPhone Backup Browser, and let it load your iTunes backup file. Step 3. Click on the (-) sign until you find the net.whatsapp.WhatsApp folder. 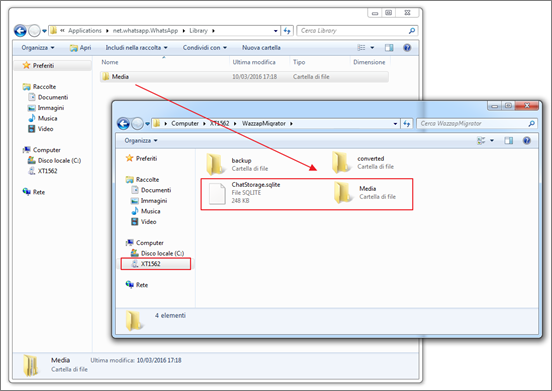 Under this folder, find and extract a file named ChatStorage.sqlite which stores all the WhatsApp text conversations. For media backup, you should extract all the files under the Library/Media section. Step 4. Then move the extracted files from your computer to Android’s internal memory. Step 5. Download and run WazzapMigrator on your Android phone. After it automatically detects backup on your Android, you can browse for the text and media folders. Step 6. After getting the stuff done, tap the “Play” button to let the app do the rest for you. Step 7. 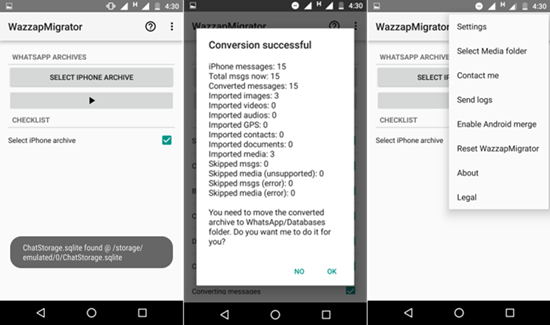 Finally, you just simply install WhatsApp on your Android and restore the local backup that created by the WazzapMigrator in the previous step. 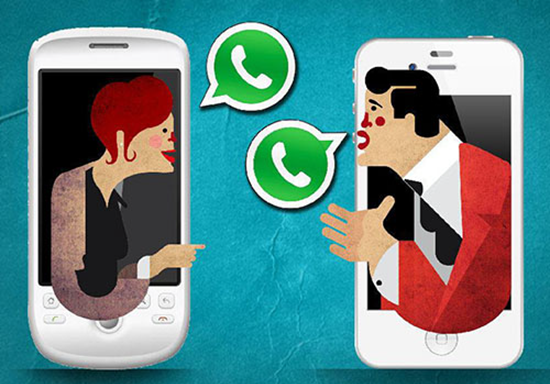 This method can only be used for transferring WhatsApp messages from iPhone to Android. The free version of iPhone Backup Browser only allows you to pull texts from iPhone backup. If you want to extract media, you should purchase the full version at $2.99. 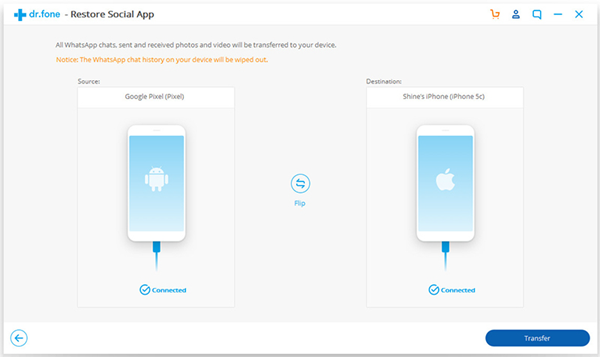 Conclusion: This article introduces 4 different methods on how to transfer Whats App history between Android and iPhone. You can choose your way according to your own situation. Good luck on transferring your WhatsApp message.